Preparations for the 2018 football season officially got underway for the Dripping Springs Tigers Monday as they kick started the preseason practice schedule. Dripping Springs is among several Austin area schools that took part in spring practices earlier this year, requiring the team to start a week later than schools that began Aug. 6. Practices will lead up to the Tigers’ season opener at home against Kerrville Tivy on Aug. 31. A full preview of Tiger football can be found in next week’s News-Dispatch. Feature photo, a Dripping Springs Tiger defender works his way around a blocker to approach a teammate during a non-contact pursuit drill. 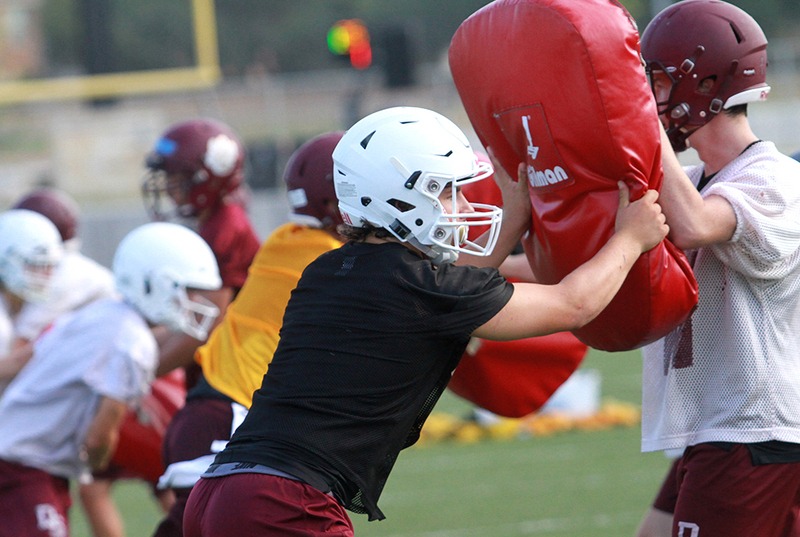 Inset, Several Dripping Springs Tiger football players engage blocking pads during a drill.